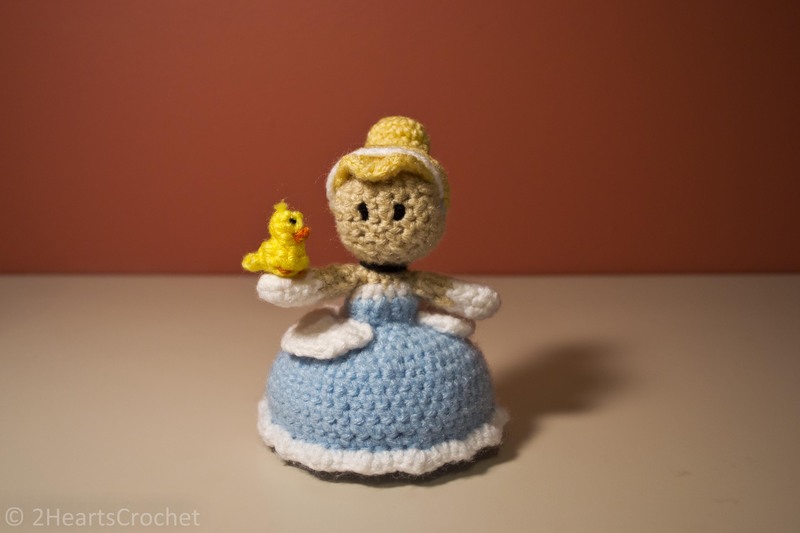 I am so excited to post my pattern for Cinderella and her little friends. (I think the little mouse is just too cute!) 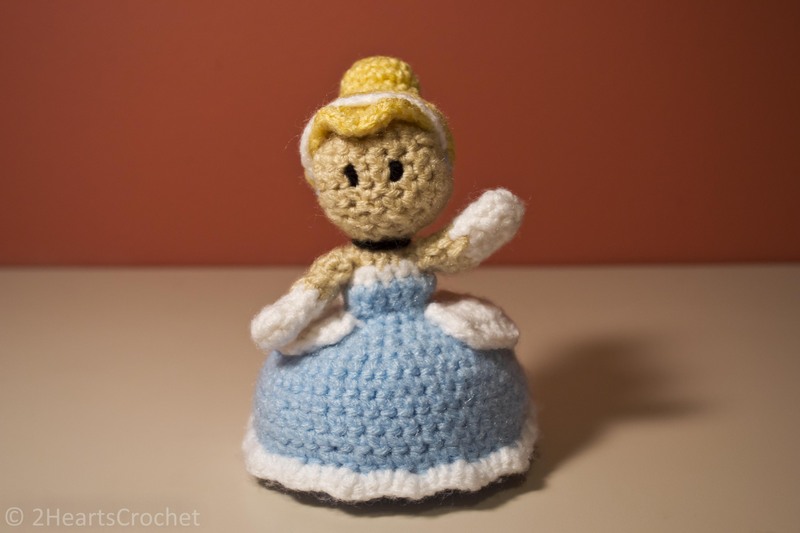 Cinderella has one of the poofiest dresses of all of the Disney Princesses, so I ammended the pattern I had originally created to do justice to her extra poofy dress. 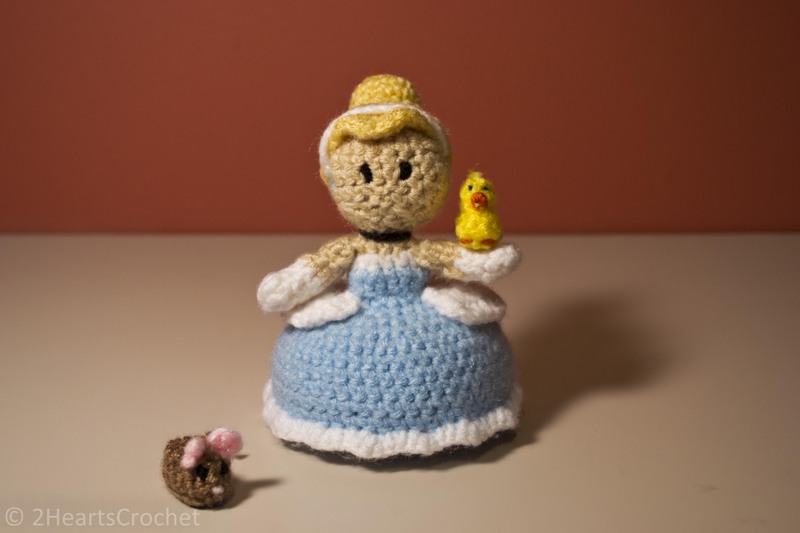 Her mouse and bird friends are just as adorable, though I think the mouse is the true winner here! I wasn’t too sure how he would turn out, but once I added the little pink nose, I was sold! I don’t think I’ve ever made anything quite as adorable. I hope you love all of them as much as I do! Rnd 14: In white, work 1 sc in each of the first 4 sts, 2 sc in next st, 1 sc in each of the next 4 sts, 2 sc in next st, 1 sc each of the next 2 sts. Change to light blue, join & ch 1. Rnd 17: Work 2 sc in each st around. Join and ch 1. Rnd 18: *2 sc in first st, sc in next st* – repeat around. Join and ch 1. Rnd 19: *2 sc in first st, sc in each of the next 2 sts* – repeat around. Join and ch 1. Rnd 20: *2 sc in first st, sc in each of the next 3 sts* – repeat around. Join and ch 1. Rnd 22: *2 sc in first st, sc in each of the next 4 sts* – repeat around. Join and ch 1. Rnd 23-27: Work 1 sc in each st around. Join and ch 1. Rnd 28: Work 1 sc in each st around. Switch to white, join and ch 1. Rnd 29: In white, working in the front loops only, *3 sc in first st, sc in each of the next 2 sts* – repeat around. Switch to light blue. Do not join. Begin rnd 27. Rnd 30: In light blue, working in the back loops only, work 1 sc in each st around. Join to first sc st of the round and ch 1. Rnd 31: *sc2tog, sc in each of the next 4 sts* – repeat around. sc2tog the remaining 2 sts of the round. Join and ch 1. Rnd 32: *sc2tog, sc in each of the next 3 sts* – repeat around. sc2tog the remaining 2 sts of the round. Join and ch 1. Rnd 33: *sc2tog, sc in each of the next 2 sts* – repeat around. sc2tog the remaining 2 sts of the round. Join and ch 1. Rnd 34: *sc2tog, sc in next st* – repeat around. Join and ch 1. Rnd 2-3: sc around. Join and ch 1. Rnd 4: sc around. Change to c, join & ch 1. Rnd 5: sc around. Join & ch 1. Rnd 6: sc around. Join & ch 1. Rnd 7: sc around. Join & ch 1. Carefully stuff the top of the sleeve just a little bit. It helps to roll the fluff between your hands to make it fit into the sleeve. Fasten off leaving a long tail. Use a tapestry needle to sew closed the remaining hole at the top of the arm. Sew to body just below the white trim/neckline of the dress. See photos for placement. Weave in ends. Rnd 1: In white, ch 6. Starting in 2nd chain space from hook: 2 sc, sc, 2 sc, sc, 2 sc. Ch 1 and turn. Rnd 2: 2hdc in first st, hdc, dc, 3 dc in next st, dc, hdc, 2 hdc in last st. Ch 1 and turn. Rnd 3: hdc2tog, hdc, hedc, 2 dc in next st, hdc, hdc, hdc, hdc2tog. Fasten off leaving a long tail. 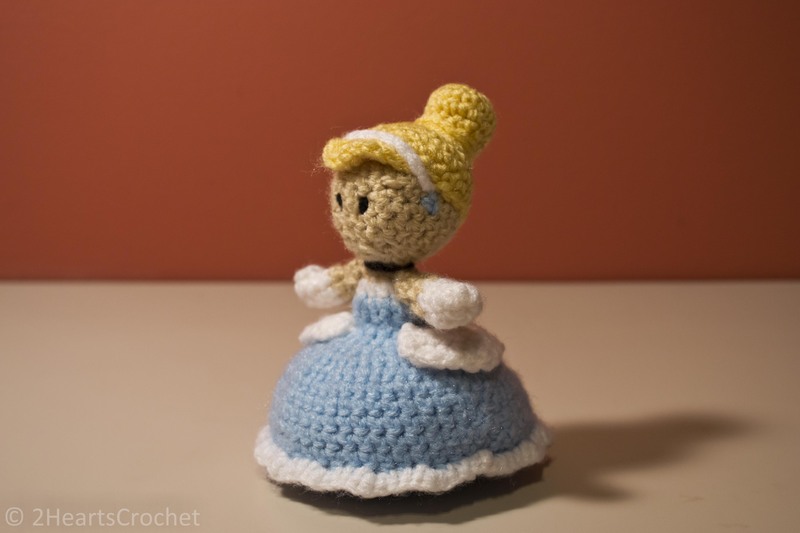 Use a tapestry needle to sew the details to the dress at the doll’s waist. Leave a smaller gap between dress detail pieces in the back of the dress and a larger gap between them in the front of the dress. See photos for placement reference if needed. Rnds 5-6: sc around. Join & ch 1. Rnd 7: sc in first 10 sts, 3 hdc in each of the next 4 sts, sc in last 10 sts. Fasten off leaving a long tail. Use a tapestry needle to sew the main hair piece to the doll’s head so that the small ridge of hdc sts is along the front of the face like bangs. Stitch behind the “bangs” and around the head. Fold the center of the bangs down towards the face, creating two small “bumps”. Make small, careful stitch with your yarn in the center, but not too close to the front of the hair piece. 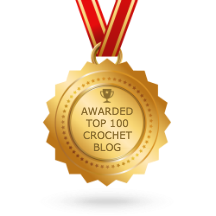 You don’t want the stitch to be visible! When you’re done, weave in your ends. Rnds 3-4: sc around. Join and ch 1. Rnd 5: sc around. Join & fasten off, leaving a long tail. Use a tapestry needle to sew the bun piece to the head, pressing on the piece as you go to make it more rectangular in shape. See pictures for placement & shaping if needed. Add a tiny bit of fluff to the inside of the bun. Before weaving in ends, take the remaining piece of the yarn that was used to sew on the bun and wrap it around the bun a couple of times. Fasten off & weave in the rest of the yarn tail. Rnd 1: In white, ch 15. Fasten off leaving a long tail. Use a tapestry needle to sew to the head behind the bangs. See photos for placement. At the base of each side of the headband, take a strand of light blue yarn and make several stitches in a cross shape enough times so that they resemble circles instead of crosses or triangles, which can happen. Weave in ends. Repeat on other side of head at the base of the headband. See photos for reference. Mouse Body, rnd 1: In light brown, ch 6. sc in 2nd chain space from hook, sc, hdc, sc, 5 sc in last st of chain. Mouse Body, rnd 2: On the other side of the chain, sc, hdc, sc, sc st in the last st. Join and ch 1. Mouse Body, rnd 3: Working in the back loops only, sc around. Join and ch 1. Mouse Body, rnd 4: Working in both loops, *sc2tog* – repeat around. Join and ch 1. Insert a small amount of stuffing into the body of the mouse, but leave enough room so that you can stich the top (the mouse’s back) closed! Mouse Body, rnd 5: sc2tog, hdc2tog, sc2tog. Join and fasten off leaving a long tail. Mouse Ears (make 2): With light pink, ch 2. In 2nd chain space from hook, sc 2 and sl st to join. Fasten off leaving a long tail. Use a tapestry needle to sew the ears on to either side of the head. Weave in ends. See photos for placement. Mouse Nose: With a strand of light pink yarn, use a tapestry needle to carefully stitch a few stitch sts over each other to make a small circle nose. Fasten off and weave in ends. Mouse Eyes: With a strand of black yarn, use a tapestry needle to carefully stitch the eyes onto the mouse’s face. See photos for placement. Mouse Tail: In light brown, ch 8 and fasten off leaving a long tail. At one end of the chain, tie a small square knot near the end. 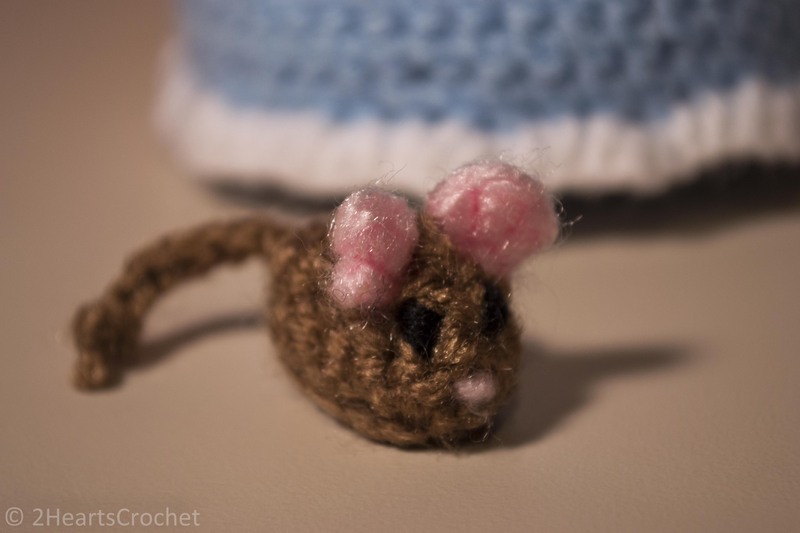 Use a tapestry needle to sew the other end onto the body of the mouse. 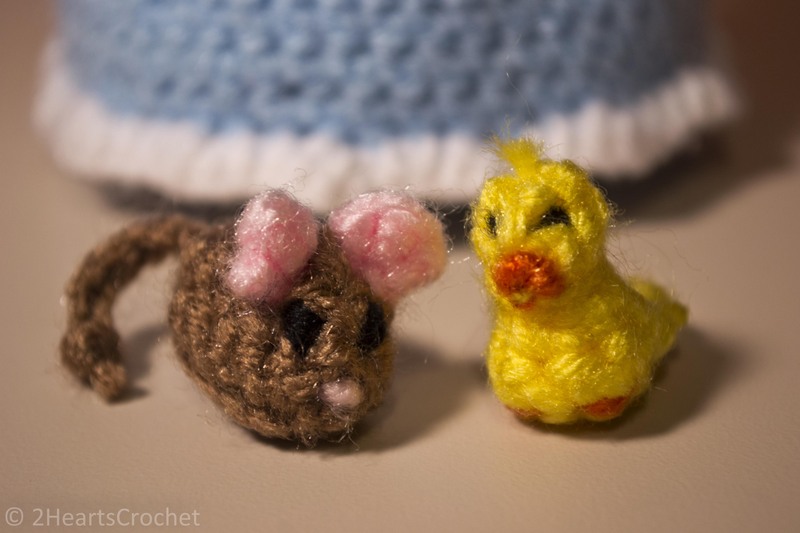 If desired, use a tapestry needle to stitch some little pink feet onto the mouse. Weave in all of your brown ends to give a little bit of substance and shape to the mouse. Rnd 1: In yellow, make a magic circle. Work 8 sc in the center of the magic circle. Join to beginning of the round & tighten circle. Ch. 1. Rnd 2: sc around. Join and ch 1. Rnd 3: *sc2tog, sc in next st* -repeat twice. sc in each of the last 2 sts. Join & fasten off, leaving a long tail. 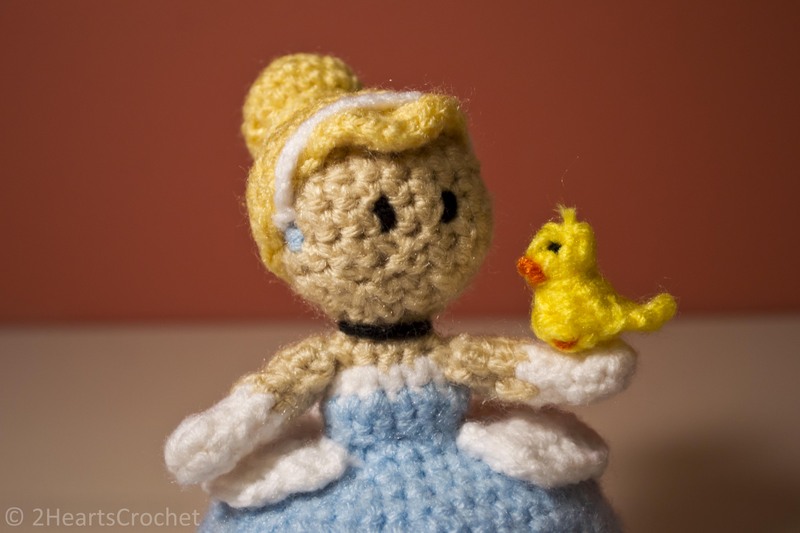 Head: With a slip knot on your crochet hook, pull up a loop from the top of the bird’s neck and ch 1. Working around the top of the neck, sc around. Fasten off leaving a long tail. Use a tapestry needle to sew the top of the bird’s head closed. Use a tapestry needle and the remaining strand of yarn to weave the tail down through to the bird’s neck and stitch around the neck to give it a more narrow shape. Weave in ends. Tail: Ch 3. Starting in 2nd chain space from hook: sc, dc. Fasten off. Use a tapestry needle to sew the tail to the body of the bird. Weave in ends. 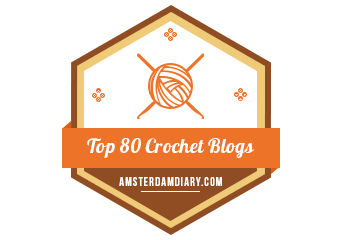 Beak: With a strand of orange yarn, ch 2. sc in 2nd chain space from hook. Fasten off. Use a tapestry needle to sew the beak to the bird’s head. Eyes: With a strand of black yarn, use a tapestry needle to carefully stitch two eyes onto the face of the bird. Weave in ends. Feet: With a strand of orange yarn, use a tapestry needle to carefully stitch two feet onto the body of the bird. Weave in ends. Bippity! Boppity! Boo! There you have it! One magical princess and two of her helpful friends. I just want to make a dozen of those little mice, but I don’t know what I would do with all of them! Stay tuned for more princess fun! Next up is my favorite princess: Aurora!